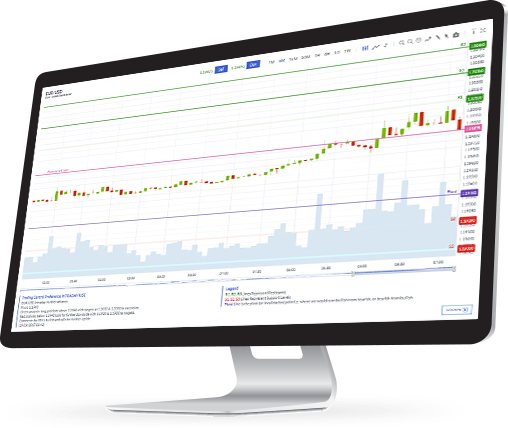 Developed by an award-winning company specialised in market analytics and research, Trading Central will optimise your trading sessions, whether you are a beginner or an expert trader. * Trading Central is available for traders only under certain conditions. Trading Central, a dynamic and efficient product, provides traders access to a multitude of technical indicators that come in hand for an extremely wide range of assets – Shares, Commodities, Indices, Forex, ETFs and Bonds. Trading Central, which is a Certified Member of three Independent Research Providers (IRP) Associations, supports investors through a dedicated chartist methodology to choose the strategies that suit their trading styles. Focus on trading the markets while an efficient built-in software that supplies you with daily market data for your strategies. Define and evaluate your trading plans by using certified & relevant information from awarded third-party providers! Increase your knowledge on your favourite instruments with extensive technical and fundamental analysis reports. A rich functionality on any mobile device will make the markets easier to access whenever you feel like trading!